Insotel Fenicia Prestige Suites & Spa is a luxurious hotel perfect for couples wanting to relax and unwind in Santa Eulalia. The hotel boasts beautiful modern architecture and spectacular gardens full of exotic trees and plants, centred around the large freshwater swimming pool, and its sun terraces. Families can enjoy a separate children’s swimming pool, as well as a Kids’ Club with activities throughout the day. Head to the spa for massages, facials, and a thermal circuit, or simply relax in the bright and modern rooms as you take in the blue and greens of the landscape. When it comes to dining there are three restaurants to choose from; two a la carte and one gourmet buffet restaurant. 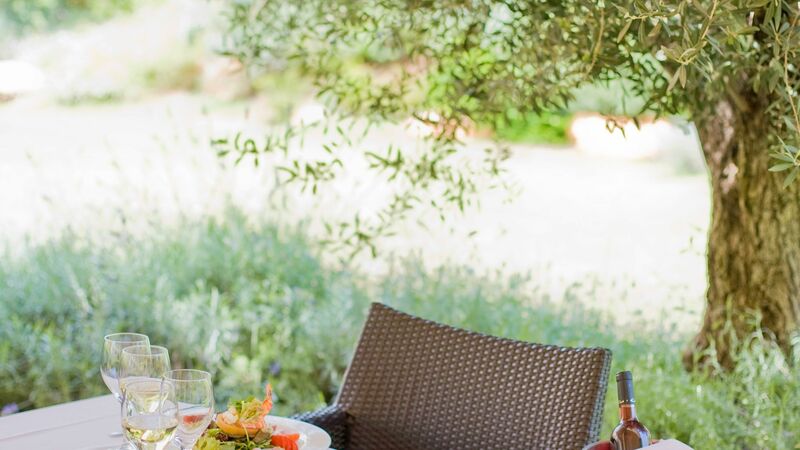 Choose from Mediterranean and Asian cuisine or enjoy light bites by the pool. 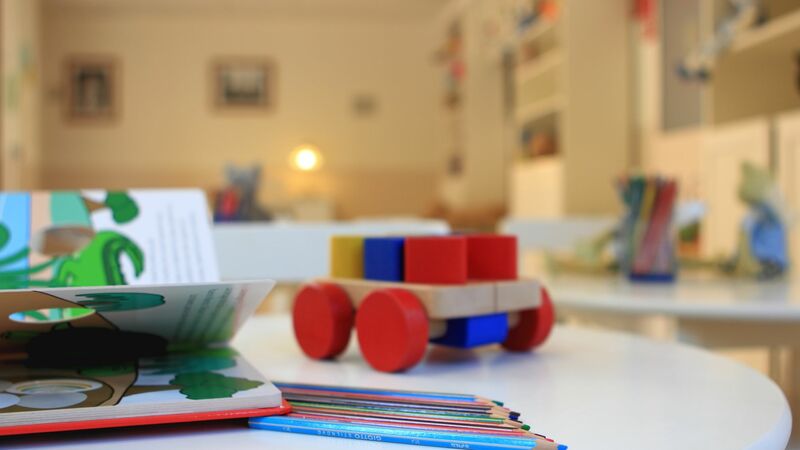 Hotel child prices apply to ages 2–12 years. The hotel has 172 rooms. 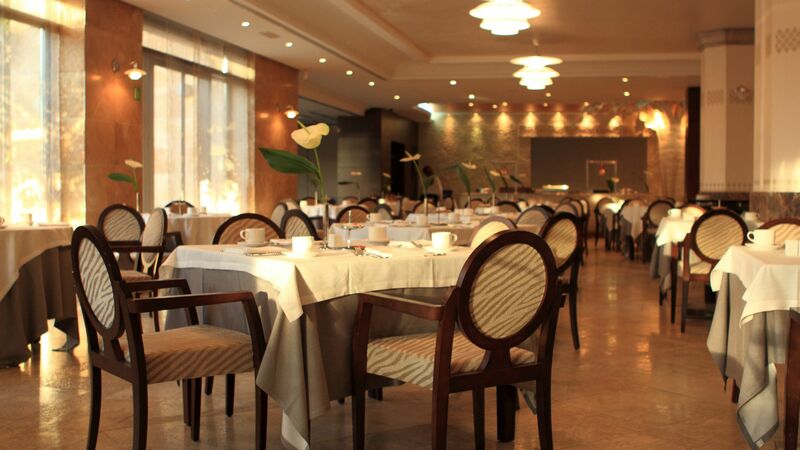 Enjoy exquisite buffet dining in this elegant restaurant for breakfast and dinner. Choose from dishes made using fresh local produce and enjoy show cooking in the evenings. There is also an al fresco terrace. Half board includes breakfast and dinner in the Fenicia Buffet Restaurant. Rustic details complete this luxurious restaurant where you can choose from Mediterranean flavours, Spanish and international dishes. Dine al fresco or in the restaurant. 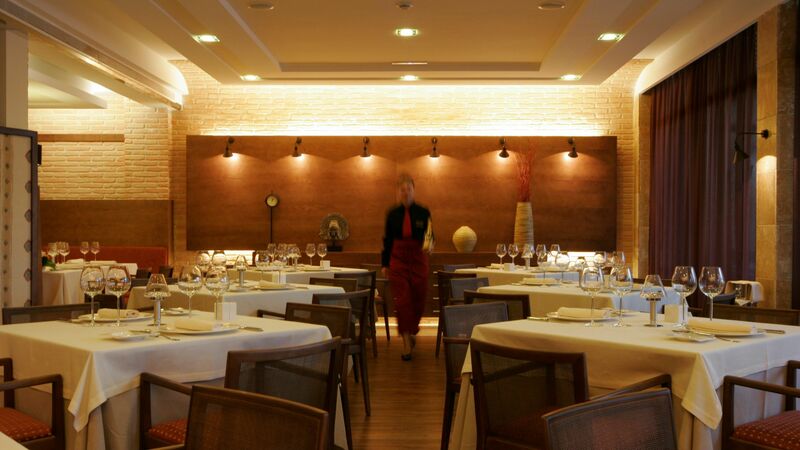 Half board guests can enjoy dinner at La Vinoteca Gourmet Restaurant. 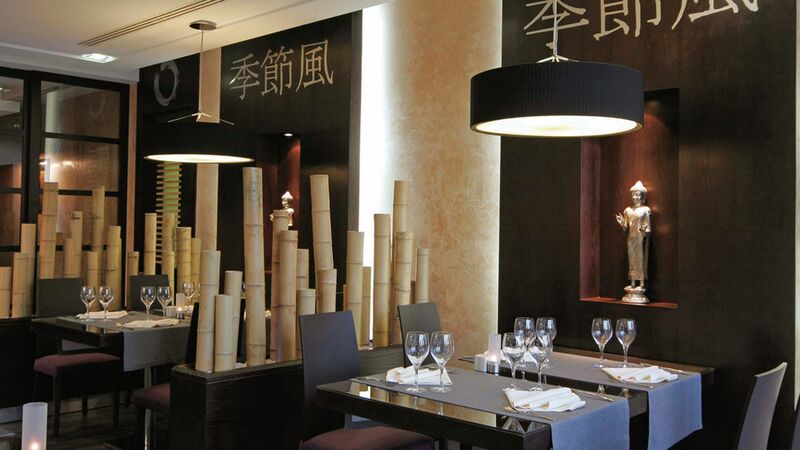 This chic, Asian inspired restaurant offers beautiful interiors and a pretty outdoor terrace. Choose from fusion dishes with flavours from Thailand, India, Japan, China and more. Half board guests can enjoy dinner at the Monsoon Restaurant. 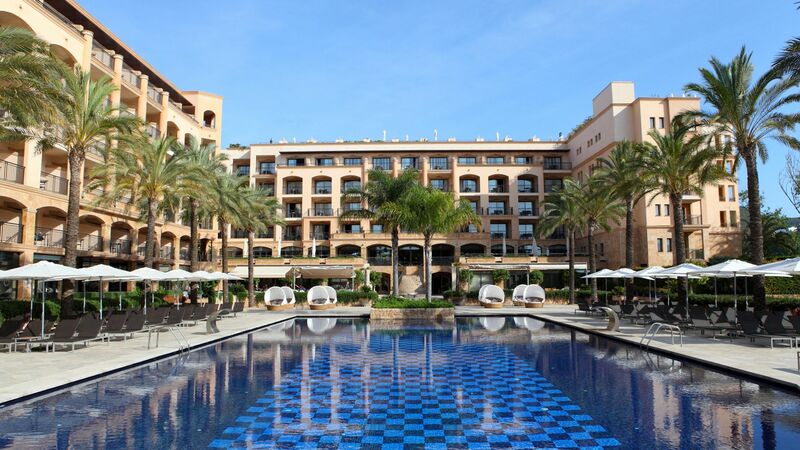 Surrounded by the exotic hotel gardens, swimming pool and palm trees relax in this quiet oasis as you choose from tapas, Mediterranean and fresh seafood dishes. Drinks and cocktails are also served throughout the day. This colonial style bar has rustic wooden touches and a quiet, cosy atmosphere. Choose from an extensive menu of spirits, cocktails, fine wines and champagnes. Dine in style in the large and inviting interiors as you listen to the live piano music or take in views of the sparkling ocean from the terrace. The menu includes cocktails, soft drinks, wines and more. Surrounded by the hotel’s elegant architecture, exotic gardens and warm sun terraces, the swimming pool is the perfect place to relax and unwind. There is also a pool for babies and toddlers, as well as a hydro massage pool and indoor pool at the spa. The golden sandy beach is just a few minutes’ walk away from Insotel Fenicia Prestige Suites and Spa. It’s the perfect place to soak up the sun, with sun loungers available to rent and clear waters for a cooling swim. Little ones will be entertained all day with games and activities, including arts and crafts, cooking, treasure hunts and more. There is also a games room with toys and a TV. 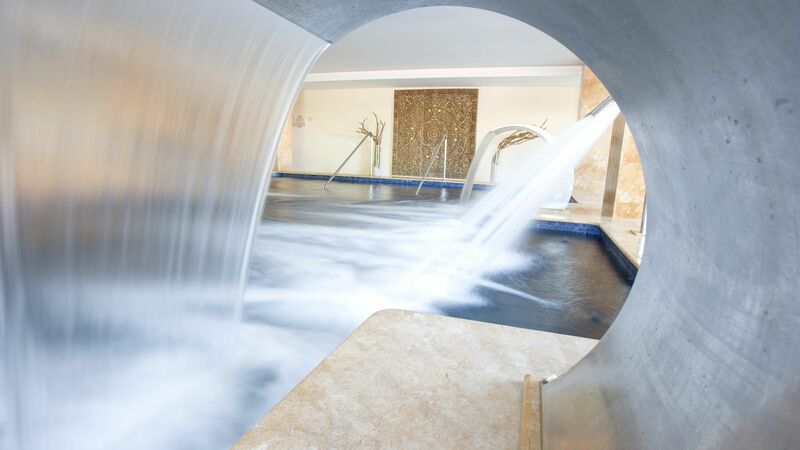 A spectacular hydro therapy pool is at the centre of the spa where you can enjoy a thermal spa circuit, sauna, herbal steam room, ice fountain and lots more. There’s also a range of treatments available, including massages and facials. Children under 16 years are not permitted in the spa. There is a well equipped gym with cardio and strength machines and air conditioning, perfect for those wanting to keep fit during their stay. Children under 16 years are not permitted in the gym. Located on the east coast of Ibiza, Insotel Fenicia Prestige Suites and Spa offers guests the chance to relax on the beach as well as enjoy the amenities of lively Santa Eulalia. The town is ideal for those in search of luxury, with a host of boutiques hidden down its pretty streets, as well as some excellent dining options. The marina is home to upmarket restaurants, while the town is known to be the centre of Ibiza’s luxury dining scene. There are two beaches to choose from in Santa Eulalia; one with plenty of amenities and water sports in the centre of town, and the quieter Mariner’s Beach. If you want to explore some of the historic architecture head into the centre, where you can also take in views of the sparkling sea. Insotel Fenicia Prestige Suites and Spa is a 25 minute drive from Ibiza Airport. Double Deluxe rooms are modern in design and offer twin beds, an en suite bathroom with bathtub and shower or hydro-massage shower and a furnished private balcony. Junior Suites have views over the sea, main swimming pool or Santa Eulalia River. They feature either a king size bed or two single beds and have a seating area with a chaise longue. Prestige Junior Suites are spacious with distant views of the Mediterranean Sea. They have two floors and a 26m² sundeck with mini hydropool and outdoor shower. These suites have superior facilities including a DVD/CD player and hydromassage bath. These suites have a king size bed. A pair of Junior Suites which interconnect, giving an ideal space for families. Each individual suite has views over the sea, main swimming pool or Santa Eulalia River. They feature either a king size bed or two single beds and have a seating area with a chaise longue. Complimentary Upgrade to Half Board for holidays between 28 Juni - 29 October 2019 booked between 01 - 30 April 2019. Save up to 30% discount when staying for a minimum of 4 nights for holidays between 01 May - 29 October 2019, booked by 30 April 2019. Save up to 45% discount on the Half Board supplement for holidays between 01 May - 29 October 2019. Honeymooners will receive a bottle of sparkling wine, strawberries and chocolate in their room on arrival for holidays between 01 May - 29 October 2019 (minimum stay of 4 nights required). Sovereign guests receive a bottle of sparkling wine per room on arrival for holidays between 01 May - 29 October 2019 (minimum stay of 4 nights required). First time at this hotel but stayed several times in this gorgeous resort. This time wanted a bit of luxury and booked a top floor junior suite with hot tub. A very attractive hotel of quality build and room well appointed and super quiet with a lovely bathroom, however it did lack any sort of mirror for shaving or make up. Huge mirrors the length of both rooms but sink and dresser meant you cant get close. Shower was super but nowhere at all to put shampoo, soap towel etc. Very poorly designed.Lights were good once you worked out which switch was which! Best selection of Tv chanels we ever had abroad and good wifi. I would not recommend these rooms for children or the infirm as the steep marble staircase to the roof terrace could be very dangerous and is open to the room. No info given at check in about the hot tub. Eg its freezing cold and you have to ring down for a guy to come and top it up with hot water. This was not really a problem as he always came promptly but we had to find this out by complaining that the tub was disappointingly cold (the idea of paying so much extra for this room was to help my arthritis in the warm water) Hotel pool lovely but pool freezing there too.Very strange that you have to ASK if you want a mattress topper which I only found out by emailing them in advance to check if they had them as people had mentioned the hard beds. Thank goodness I did as the floor would have been only slightly harder than those beds! I saw several people at breakfast clutching their backs even a young girl who i told to request a topper. Maybe its just me but I do not go on holiday to sleep on a brick! No one stays in the hotel much in the evening as the bar prices are ridiculous and some fabulous entertainment (musicians) were watched by most people from their terraces that overlook the entertainment area. Therefore when you did use the bar there was very little atmosphere. Why dont these hotels charge reasonable prices, keep people in and make so much more money?? Having stayed at the La Cala (right in town) their bar was packed and buzzing every night as their prices were equal or less than the bars. Found breakfast poorly laid out and confusing. Ok food but certainly had much better. Ate in the Asian and Med a la carte and the latter in particular was superb. Again no atmosphere as we were only 2 of 4 people in there. Very annoyed that you had to pay to enter the spa, not even one free entry. Never stayed in a 'spa hotel' before that didn't include at least one visit. The very best thing about the hotel is its location for lovely strolls along the excellent river path and to the lovely seafront promenade to town. We will certainly be back to Santa Eulalia but may not the spend money on this hotel again. First impressions of this hotel are good. The quality of the building and it?? ?s fixtures and fittings are outstanding. Clearly no expense has been spared in its construction and decor. All the main doors are sensor controlled and open automatically. (So one has to question the veracity of MikeBrown48?? ?s review below re doors held open.) The bedrooms are spacious and well equipped, although they lack a shaving/cosmetic mirror in the bathroom and there are no tea/coffee making facilities. They also change the towels everyday, regardless of whether they are hung up or not, which is a bit galling when there is a not insignificant tourist tax levied for environmental reasons! Our balcony, like the majority, faced East, so got no sun after about 8.00am, leaving it too chilly for the rest of the day. It was also noisy, mainly from the children?? ?s pool. However, one quickly becomes aware that the service here is all about the hotel, rather than its customers. With the exception of Manuel at the pool bar, who gives a really personal service and clearly enjoys being with people, the management is geared around processes, rather than people. The check-in process was distinctly underwhelming. No effusive welcome, no sit down with welcome drink, merely formalities. A voucher for a free drink each is given, which we handed over at dinner, only to be told that it could not be exchanged for glasses of wine - just cava, water or juice at the bar!!! Waiters were tasked with clearing tables and taking orders for drinks, if they noticed you come in and sit down. There were occasions where no-one approached us at all and catching someone?? ?s eye was difficult. There was no welcome into the restaurant, or help in finding a table and the atmosphere became even worse if the manager was present. Even Manual?? ?s attitude changed and smile disappeared. The food rarely varied: pasta choice always the same three sauces, meat and fish were on a 3-4 day rotating cycle and the veg never varied, e.g. potato choice was always just chips or sliced baked potatoes. The food was not hot, the veg undercooked, and the quality of the food, and cooking was poor and lacked flavour. The exception being that served in the pool bar at lunch time, which was freshly cooked to a good standard and tasty. Breakfast was better, but again lacked variety. Fried eggs were either over or undercooked. We were told at check-in that we had an allowance against our half-board to eat at the two a-la-carte restaurants, but they omitted to mention that they closed three days after our arrival (we were there for two weeks!). We only discovered by talking to fellow guests several days later! The downsides of the pool bar is that it is all under cover and right next to the children?? ?s pool so the noise of loud children?? ?s voices was constant. There was no-where else to eat at lunchtime in the hotel. Any complaints are met with a very defensive ???it?? ?s anybody?? ?s fault but ours??? and ?? ?no-one else has complained??? attitude, which we knew from listening to other guests was not true. Twice our emails were hacked into on our iPad, but the IT technician blamed Microsoft!! (On an iPad!!!) This problem ceased when we installed a VPN. Lack of food labelling in the restaurant the manager blamed on ?? ?the difficulty of motivating staff late in the season.???. Serving staff spoke little/no effective English, so communication was tricky. They also insisted on charging us ?? ?85 to keep our room until 5.00pm on the day of departure, despite the fact that the hotel was virtually empty. Only reference to the manager prevented this. At no time were we asked if we had enjoyed our stay, at no time were we asked if everything was OK and there were no customer surveys to complete. The bland, repetitive comments by the manager on the negative reviews on this site speak volumes. To sum up: the fabric of this hotel is five star plus. The attitude and service is more like two. Most disappointing and a marked contrast to others and particularly with the last five star hotel we stayed at. Gorgeous hotel, the staff were lovely. The room was modern and comfortable ! We had half board and there was a good range of food! I had a treatment at the spa which I thoroughly enjoyed! Would definitely come back to this hotel as it is also in a good location! We stayed with family for a long weekend in what was probably the end of the season for Ibiza. The hotel is clean and well looked after but it was shame that all but 2 of the restaurants were closed and the whole place just felt like it was about close. No turn-down in the evening either. Pool area was nice but the pool food was poor especially for the price. No concierge just a car rental lady each morning. Also, as we did not book direct we could only use the spa for 35EUR per day per person. If you book direct then the spa is included. Otherwise the positives were that is was just a 5 min walk to the marina where there are plenty of bars and restaurants to choose from. A bus to Ibiza Town can also be caught near the marina. Nearby towns such as Santa Getrudis also not too far away by car. Mini market a few mins walk away and a childrens playground around the back of the hotel. I am sure in peak season this is place is thriving and would be a lovely place to visit. We had such a wonderful time in Ibiza and spent three fantastic nights at Insotel Fenicia Prestige Suites & Spa!! Thank you for making us feel so welcome and helping make this a holiday to remember. Great facilities and location! The staff are so friendly and tirelessly held every door open for us everyday. Neus, the Housekeeping Manager, helped us so much, for us she is the best staff member of the Hotel! Well done! The food choice is definitely the widest selection we have ever experienced. We will be back! !